Now you've done it, the whole neighborhood is begging for your barbecue. The Durango 24" will deliver. 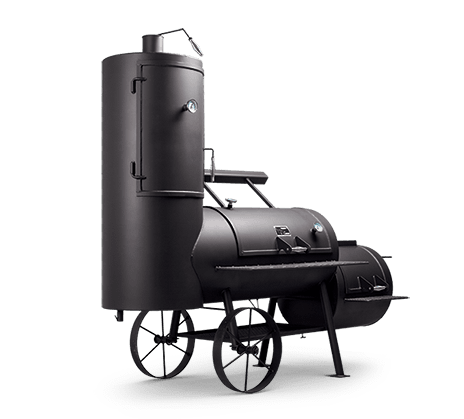 With 4,141 total inches of cooking surface: 418 square inches of direct grilling surface in the firebox, 1,691 square inches of horizontal indirect grilling surface on 2 shelves and 2,032 square inches (5 shelves @ 406 square inches each) of slow smoking surface in the vertical chamber. Quickly achieve 700 degrees for searing steak, 400 degrees for indirect grilling, 200 - 250 degrees for barbecuing or down to 150 degrees for slow smoking and warming. Yes, it's that versatile. Remove the top rack(s) in the vertical chamber and gain access to the Durango's hanging bar for hanging your favorite slow smoking foods. As with all Yoder products, the heavy ¼inch steel construction and efficient air flow management system produce blue ribbon results, with minimal effort.